Last week was a great food week. You know, one of those where everything tastes the way you want. Good for me and for Vishnu! I adapted Gina’s recipe and used 1/2 cup applesauce and 1/2 cup pumpkin puree. Delicious! 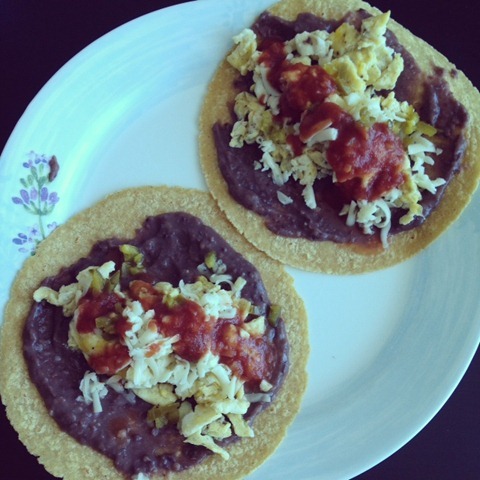 These tacos were so good – corn & wheat tortillas, refried black beans, scrambled eggs, cheddar cheese, jalapeno, and salsa. I sautéed onions, garlic, carrots, zucchini, mushrooms, broccoli slaw, and tofu in a little bit of olive oil and added salt, pepper, and TJs 21 salute seasoning. I made the sauce by combining PB (microwave for 20 seconds), soy sauce, lemon juice, and a little bit of water. YUM! I don’t have a recipe for this (oops!). It’s a combination of onions, mushrooms, carrots, garlic, diced tomatoes, tomato paste, black/garbanzo/kidney beans, cumin, chili powder, cayenne, salt, and pepper. I also added two “secret” ingredients – PB and cocoa. I’ll document the exact amounts of each ingredient the next time around. 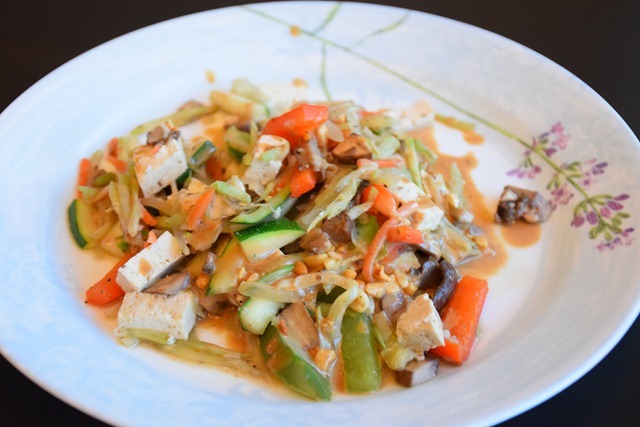 Davida’s recipe could not have come at a better time! I (over) baked four eggs in a pan full of chili and can now say that if you haven’t tried this, you really should! 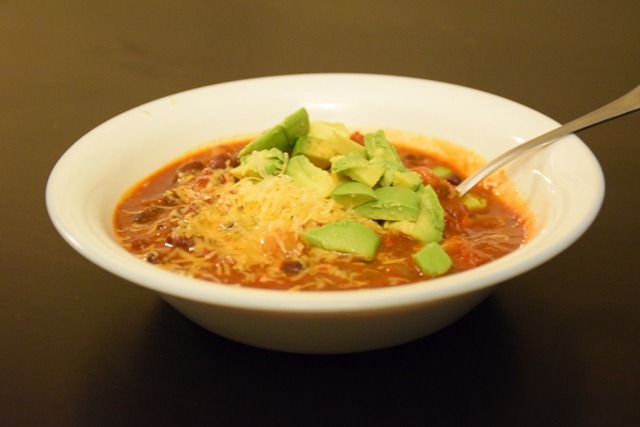 Chili + egg is a delicious/filling combination. Well, that was our week in home cooked food! Tell me – what did you make last week? Recipe links welcome! Oh wow can I come live with you guys- such yum eats! I especially intrigued by the sound of that chilli! One of my favourite dinners last week was kale sautéed with coconut oil & topped with runny eggs- so basic yet really hit the spot. I’m planning to make it tonight so hopefully I remember to photograph/write down the recipe! And the kale/egg recipe sounds so good! I made kale egg cups before – so yummy (link is on my recipe page). 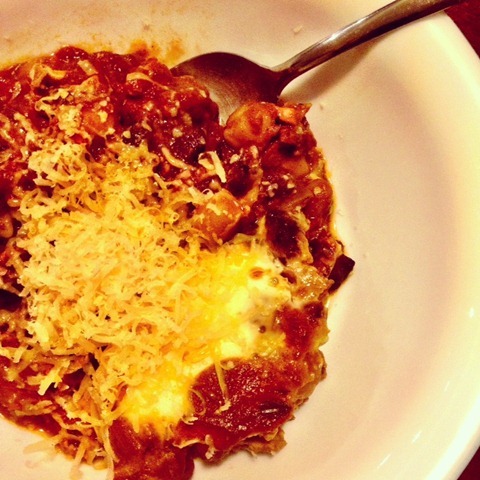 Last week we had our first spaghetti squash of the season – so good! It was basic with onions, red sauce and parmesan but still delicious! And even better as leftovers. 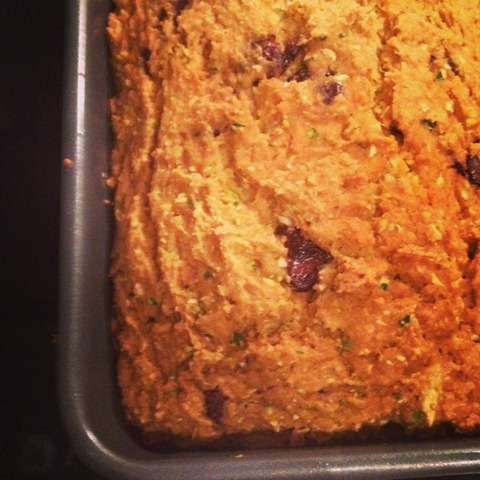 Mmm love zucchini bread and i’m sure the pumpkin made it even more delicious! Yes! The pumpkin made the bread a little more dense. Still delicious though! That egg/chili thing is going to have to happen in my life very soon! Everything looks great! Kacy recently posted…Food: Merroir, Rappahannock Oyster Co. Thanks, Kacy! And yes, def. try the baked egg in chili idea. We really loved it! Now I just have to figure out how to bake an egg properly! Everything looks so delicious! I’m definitely going to have to try the chocolate zucchini bread.